Pump tank stations and pumping systems are designed to circulate fluids (typically water or a water-glycol solution) through dedicated or multiple process applications to support the cooling applications of entire processing facilities. Pump tank stations and pumping systems work with one or more evaporative cooling towers in COOLING TOWER SYSTEMS or with one or more chilling modules in CHILLED WATER SYSTEMS to provide a complete central process cooling water distribution system. 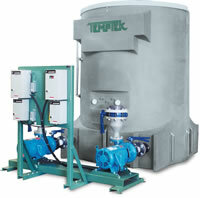 Pump tank stations and pumping systems use a large fluid reservoir and circulating pumps to move water through the plant's distribution system. Pump tank stations are offered in 200 to 3200 gallon capacities for the reservoir with circulating pumps and pumping systems offered from 1HP to 100HP. Reservoirs are available in polyethylene or mild steel. POLYETHYLENE RESERVOIRS use a patented hybrid design to create a structurally sound cylindrical reservoir that offers total corrosion resistance in most cases of untreated water. Polyethylene reservoirs can be used for tower or chilled water systems. One piece seamless construction ... no leaks! MILD-STEEL RESERVOIRS use steel sheets, double pass welded into a rectangular reservoir and reinforced by angular tank banding. Mild-steel reservoirs are epoxy tar coated on all wetted surfaces and can be used for tower or chilled water systems. 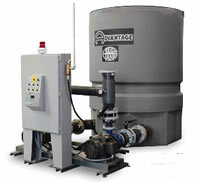 Advantage Tough Tank™ Series model TTK-850 shown with polyethylene reservoir and optional standby pump and manifold, control cabinet, alarm beacon and Checkmate™ instrument control system. 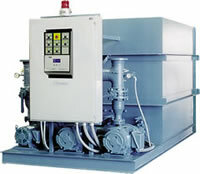 Advantage PTS Series model PTS-1200 shown with mild-steel reservoir and optional standby pump and manifold, control cabinet, alarm beacon and Checkmate™ instrument control system. 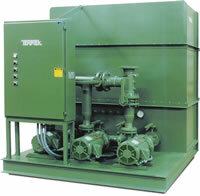 Temptek PT Series model PT-750 shown with 3 pump manifold (process, reciprocation and standby). Model shown complete with the following options: valves mounted with discharge manifold, prewired system cabinet.